Gather the mint leaves and clap them between your hands, rip them in half and wipe them around the rim of a highball glass, push them to the bottom of the glass. Place the tangerine segments on top of the mint and squash them with a rolling pin until the juice has fully drained. 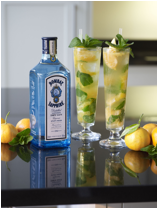 Add the Bombay Sapphire, lemon juice, and sugar syrup and stir well with a long spoon. Add crushed ice to ¾ full point in the glass and stir well in an upward lifting motion ensuring that the mint is evenly distributed throughout the cocktail. Top up with soda water and stir for a final time. Garnish with the lemon wedge and a large clapped mint sprig next to a straw.